Since President Donald Trump began his campaign to tackle intellectual property theft by Beijing, the U.S. State Department has issued restrictions on granting visas to Chinese graduate students in certain high-tech fields. Scholars studying robotics, aviation, and high-tech manufacturing—fields identified as national priorities by the “Made in China 2025” economic blueprint—would be limited to one-year visas. Such limitations went into effect on June 11, according to The Associated Press. Amid this backdrop, the first public case has emerged of a top Chinese neuroscientist being denied a visa to the United States to attend a workshop organized by the U.S. National Science Foundation, to be held on July 23 and 24. Rao Yi is a neuroscientist and dean of the Peking University School of Life Sciences who studied and worked in the United States for over two decades, before returning to China in 2007 to take up his current post. He later surrendered his U.S. citizenship. Rao forwarded an email to a number journalists in which he appealed to the U.S. Embassy in Beijing to allow him to visit the United States, according to a July 18 report in Science magazine. He told Science magazine that he was regularly traveling to the United States until 2016, when he was first denied a visa to travel to San Francisco for a reunion at his alma mater, University of California–San Francisco. On July 16, Rao had an interview at the U.S. Embassy, where he was asked to provide an updated CV and his travel schedule. But his visa request was not granted. It is unclear whether Rao was denied in connection with the recent State Department visa restrictions, though the new policy reported widely in May did not include the field of neuroscience, nor senior scientists. 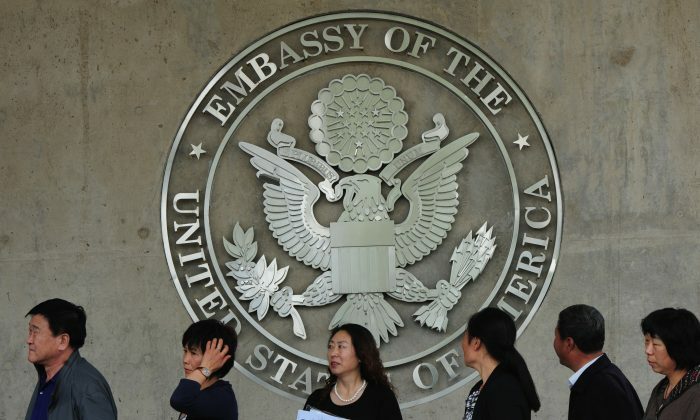 The U.S. Embassy in Beijing said it would not comment on individual visa cases. Meanwhile, Chinese netizens noticed that at a major week-long space research conference held in Pasadena, California, starting from July 14, a group of Chinese experts were noticeably absent from a panel. CSES (China Seismo-Electromagnetic Satellite) is a Chinese–Italian joint space mission to launch a satellite that can monitor electromagnetic fields and waves. The satellite was launched in February 2018 from the Jiuquan Satellite Launch Center in Inner Mongolia. On July 15 and 16, the COSPAR (Committee on Space Research) conference had scheduled several panels that would present findings from the space mission. However, some Weibo users first reported that the panel organizer said the Chinese panelists were unable to receive visas to attend the conference, according to Chinese media Guancha. Weibo is a social media platform similar to Twitter. The chief Chinese scientist of the CSES project, who was scheduled to appear at COSPAR, later confirmed the news to Guancha, saying that it is unclear why they were unable to receive visas. COSPAR told Guancha that it could not confirm the reason why invited participants were unable to attend. The United States’ recent visa restrictions reflect concerns about a real trend: Chinese nationals who excel in important fields after studying or working in the United States, only to later be recruited back to China. The Chinese regime has established several recruitment programs meant to attract overseas Chinese in the science and tech fields to work in China. Such programs are a key part of China’s strategy to catch up with and eventually supplant global tech industries. Tong Guanshan, for example, worked for IBM for more than a decade, serving at the global headquarters in multiple positions. In 2016, Tong became the senior VP and chief technology officer of BOE, a manufacturer currently in tight competition with South Korean firms in the cutting-edge field of OLED (organic light-emitting diode), a new technology for making brighter, more color-intense screens on electronic devices. Robin Li, the founder of China’s Baidu search engine, was himself recruited after working in the United States. After creating the company he also recruited Xu Wei, a former senior scientist at Facebook, to join Baidu’s artificial intelligence research lab, as well Wu Ren, who left his job at top American chipmaker Advanced Micro Devices to become a Baidu chief software architect. The Chinese regime has used this tactic since the early days of its communist history. Qian Xuesen, a rocket scientist, studied at the Massachusetts Institute of Technology and Caltech, later becoming involved with the Manhattan Project to develop nuclear weapons, according to an article in The New Yorker magazine. In 1949, as the Communist Party rose to power in China, Qian was preparing to return to his homeland—only to be stopped by U.S. authorities on suspicions that he was a Communist Party member. He was eventually released in 1955. Soon after arriving in China, he became the director of a program to develop ballistic missiles and nuclear weapons and was integral to the development of China’s first atomic bomb.